Find hotel near Muzeul National George En .. 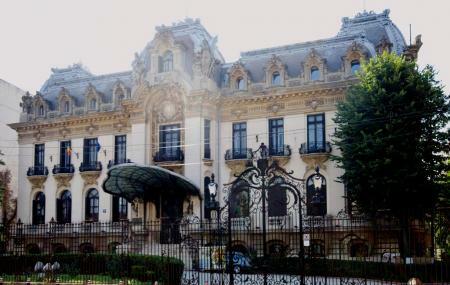 Although many seem to think that this is indeed the house of George Enescu, it is not. The house was formerly owned by the landowner George Cantacuzin. It was not until 1956, one year after George Enescu's death, that the house was converted into a museum dedicated to his life and art. If you don't know, George Enescu was one of Romania's foremost composers in his time. The house is not only filled with memorabilia from his life (musical instruments, photographs, manuscripts, documents)and exhibitions of his work, but also provides a valuable insight into Romanian music history. The palace is one of the most beautiful buildings in the city. 75% discount to students, moderately disabled adults, cardholders of 'Euro <26'. Free for severely disabled adults, children under 18 during vacation time, preschoolers. Free on 26th of every month. How popular is Muzeul National George Enescu? People normally club together National Military Museum Bucharest and Tineretului Park while planning their visit to Muzeul National George Enescu. I enjoyed visiting the George Enescu National Museum in Bucharest, but objectively I don't see how anybody can give it a rating higher than 3/5 stars. It's quite small, with just three main rooms open to visitors, one of which is just rollups. There are a few good things to see inside. However it's a shame to see such a beautiful building decay, with the plaster peeling off the walls and ceiling. On the plus side, taking into consideration that the ticket costs around just one euro, I'd recommend a quick visit if you're in the area. one day i woke up and had my breakfast while listening George Enescu's Romanian Rhapsodies which amazed me so I immediately clothed and went out. Guess where ? Of course to George Enescu's museum. You should do the same..
One of the most exquisite French Baroque/Art Nouveau styled Mansions you will ever see in any country, especially Romania. It's a national treasure both for cultural and architectural reasons. Still furnished with many of the original stained glass, statues, paintings and more despite time and weather wearing being all too visible on the ceilings and some of the walls. It adds something to the place though. There is a concert room kept off limits to the public unless there is a performance scheduled. Amazing acoustics for classical and opera recitals. There is also a 5 RON tour available for the right wing of the house where artifacts from the life and experiences of George Enescu can be seen. It's small and short, no guided tour offered. It won't take more than 30-60 mins to complete. The grounds are not expansive but also worth a short tour with permission from security. Small place but very nice!! It's a pity that now that I visited it the second time the concert hall was closed for renovations. It's the best part in all the house.